The St George Illawarra Dragons have been dealt a huge blow to their finals hopes, becoming only the third team to lose to the Newcastle Knights in 2017. The Newcastle Knights are destined for the wooden spoon but will still fancy their chances of severely denting the finals hopes of the St George Illawarra Dragons this afternoon. Join The Roar for live scores and commentary from 3pm AEST. After losing four of their previous five matches, the Dragons responded superbly at home last week against the Manly Sea Eagles, securing a 30 point victory in one of the more entertaining matches of the season. Despite the victory, there will be concerns raised about the Dragons’ defence, after the hosts nearly gave up a 30-nil deficit before racing away with the contest in the second half. Indeed the Knights themselves troubled the Dragons significantly earlier this season, racing out to a big lead away from home before losing another high scoring encounter. Recent contests between these two sides have usually been close affairs and another high scoring match awaits between two teams desperate to win for vastly different reasons. The Knights need to go on a winning run of sorts to avoid the wooden spoon. More importantly, Newcastle needs to establish some winning momentum heading into a 2018 season that promises to be more productive than the present campaign. Having secured the services of several players for next season, the onus is on the Knights to start winning matches in front of a home crowd that has had to put up with a lot of poor results over the past two seasons. The Dragons meanwhile are well in the hunt to securing a top eight birth and another win here will further entrench their place in the finals – a great achievement for club not expected to even feature in September at the start of the year. Just like last week’s match against Manly, the Dragons will aim to establish dominance up front in order to pry open Newcastle’s defence. If the likes of Paul Vaughan, Jack De Belin and Tyson Frizell are allowed to dominate, then St George Illawarra could rack up another high score this afternoon. 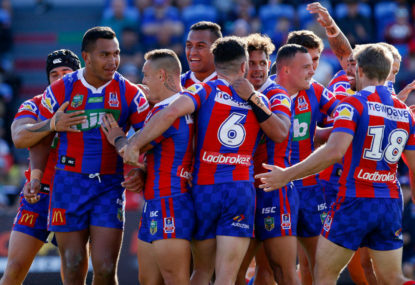 On form, the Knights have been competitive in recent defeats to the Bulldogs, Manly and Roosters all away from home and are a chance of causing the upset if the Dragons turn up merely expecting the competition points. The Dragons simply have too much to play for to let this match slip. The Knights will pose problems with the football but the Dragons should get the job done in another high scoring encounter. Alan is one of The Roar's longest serving live bloggers, covering football, tennis and rugby league.